There’s a chance you might know the name. He’s comedian Kumail Nanjiana. If not, then you’ve certainly seen his face. Besides his routines on the stand-up circuit, there are TV commercials, sit-com appearances, and an impressive if short filmography, including the engaging The Kings of Summer, the family Halloween adventure Goosebumps, and now the self-penned The Bick Sick, co-written with his wife, Emily V. Gordon. 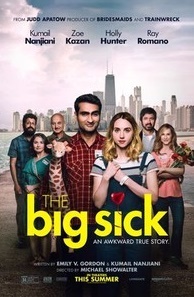 The Big Sick, it turns out, is autobiographical. It’s about their lives when they first met, their courtship, and the cultural differences between their families. It’s also about what happened when their world was suddenly turned around, and what followed. And more importantly, besides the setbacks, the upsets, and the drama, it’s also a comedy, and it just so happens to be the comedy that restores the lost faith in American comedies. It’s the one we’ve been waiting for. Maybe it was love at first woo-hoo, who knows how these things work. But by the end of the evening, Kumail and Emily are back at his low-rent apartment, lying comfortably on his inflatable mattress, and watching Night of the Living Dead on video while Kumail is attempting to explain what the film is all about. He doesn’t get far. There’s something else happening that would complicate matters if Emily knew. Kumail’s family is traditional. Marriages are arranged, and each evening at dinner, Kumail’s mother (Zenobia Shroff) just happens to have a potential suitor drop by to join everyone at the table and to meet Kumail. Hilariously, each arrive with a picture of themselves with a hand-written background; they’re like resumes for him to ponder, which Kumail politely takes and places in a cigar box along with all the other resumes. Then the unthinkable happens, and after a light-hearted, often laugh-out-loud act one, act two arrives, and it turns Kumail and Emily’s world – and the film – inside out. The title already tells you; Emily becomes sick by an illness that stymies the doctors. But one thing is clear: the hospital has to induce a coma in order to get whatever is ailing Emily under control. With no one else around, Kumail signs the paper giving permission. Despite the seriousness of the situation, the script manages to keep the humor intact, particularly when Emily’s North Carolina parents (Ray Romano and Holly Hunter, both excellent) arrive to be by their daughter’s side. When the doctors inform Kumail and the parents the current situation, it’s done in the somber hospital Bereavement Room. “It’s the only room we had available,” they explain. 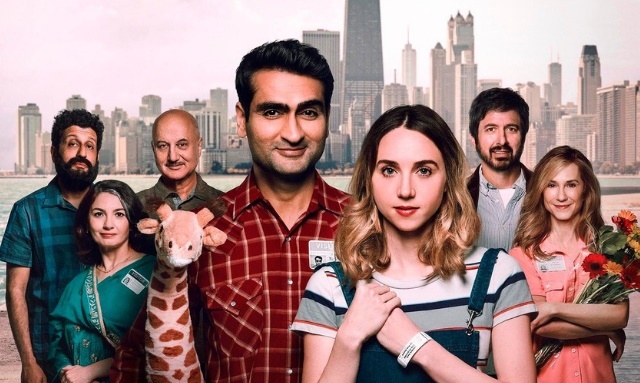 Emily’s parents don’t warm to Kumail, not at first, but soon, as Emily’s coma continues, they get to know him, and he gets to know them, and suddenly we’re faced with a new theme; the differences between families and the importance of maintaining those connections no matter how different cultures and backgrounds happen to be. The Bick Sick is smart. Kumail and Emily’s script has wit and intelligence, and from the fact that we know Emily co-wrote the film, we also know the outcome of the coma and what probably occurred later, but that doesn’t matter. We don’t know how problems are overcome and we don’t how the clash of cultures between family backgrounds will occur. Plus, the film has so much natural, good warmth, humor, and honesty that the journey to get to a film’s conclusion has rarely felt this genuinely satisfying. And that’s saying a lot, particularly in a comedy, and one that has Judd Apatow’s name as producer.